JURY’S COMMENTS: A very well executed project that successfully considers af Klint’s enthusiasm for nature, synthesizing a tangible relationship between art, built environment and nature. 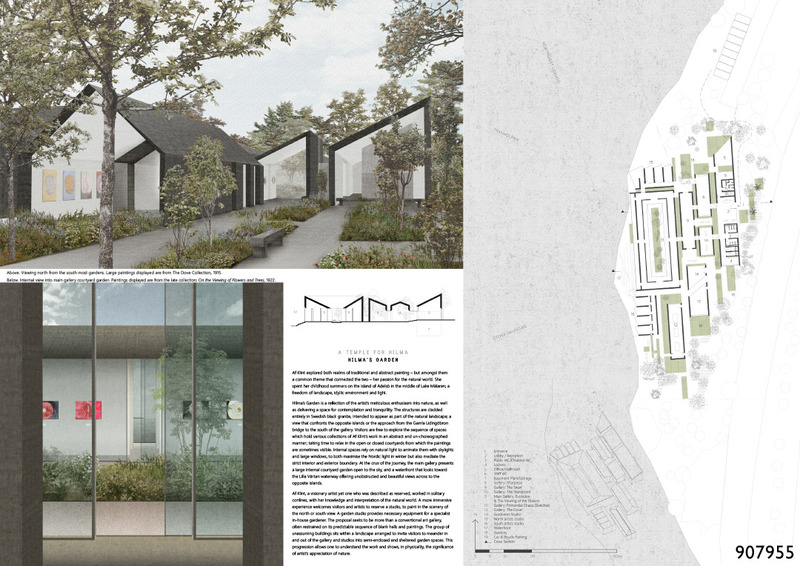 The proposal seamlessly guides the visitor through buildings and landscape alike, focusing on the courtyard to help promote a sense of exploration and adventure. A constant visibility and presence of the art from inside as well as outside the buildings – and the sense of transparency – creates an intimate, human scale of the architecture. Its smaller scale and the fragmentation of the spaces makes this a museum you would like to visit, not only for the art, but for the journey through the site. Plans are well thought out, drawings very strong and the visuals pleasant, all in all an elegant, evocative manner of representation that strengthens the concept.